Luxury boat cruise at Fort George Cay. The Beautiful by Nature Turks and Caicos! 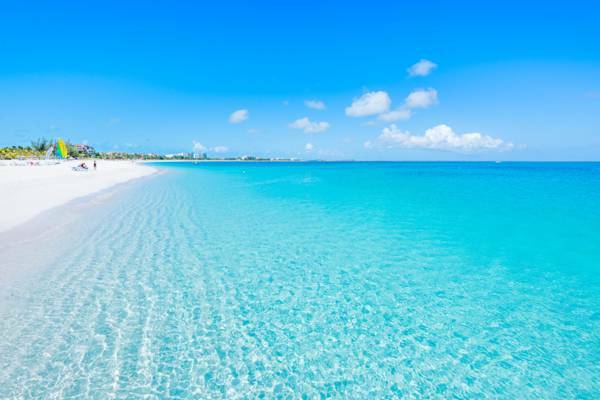 The tranquil Grace Bay Beach, Providenciales. The Turks and Caicos Islands offer plenty of opportunities for having fun. Our main claim to fame are our spectacular beaches, crowned by the award-winning seven mile long Grace Bay Beach on Providenciales. 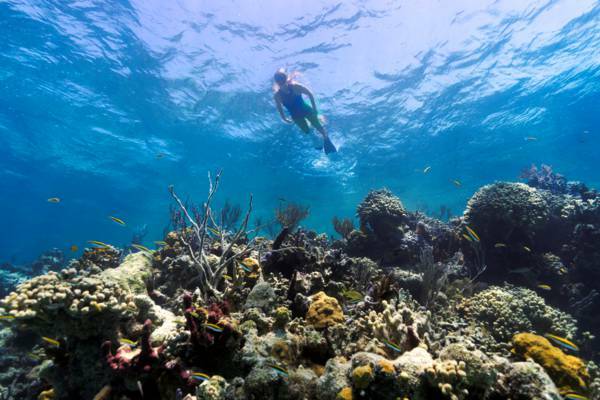 The diving and snorkelling in the Turks and Caicos is exquisite. Our islands sit on an underwater plateau that rises more than 11,000 feet (3365 meters) above the surrounding ocean floor, and the edges of this shelf are lined by miles and miles of unspoiled barrier reef. There’s numerous wall diving sites and sheltered inshore reefs, teeming with sea life to explore. For those who haven’t yet discovered SCUBA diving, the many experienced local dive operators will get you through a PADI-certified course and in the ocean with little stress. 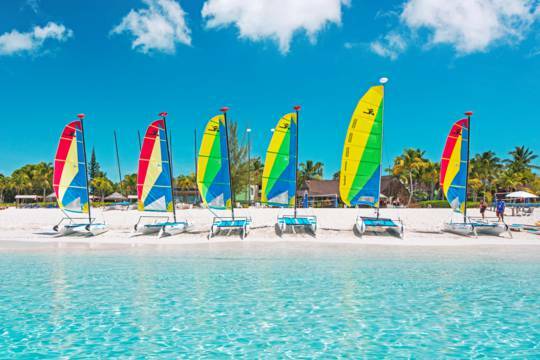 The whole gamut of water sports can be found in the Turks and Caicos Islands, including kiteboarding, wakeboarding, parasailing, windsurfing and Hobie Cat sailing. 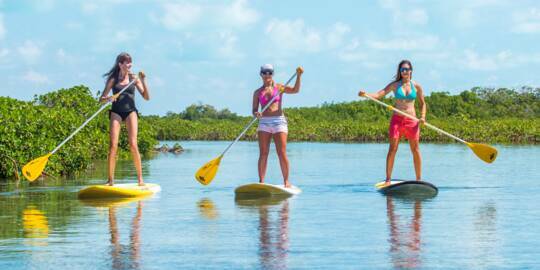 Kayaking and paddle boarding eco-tours through the mangroves and shallow flats of the nature reserves are excellent ways to get a look at the amazing sea life and birds found in the islands. Snorkelling at the barrier reef off Grace Bay, Providenciales. Providenciales is the center for the excellent sport fishing found in the Turks and Caicos. Every year, several tournaments take place, from the international Caicos Classic billfishing event held in Turtle Cove Marina to many smaller reef and bottom fishing contests. The bonefishing found on the extensive flats near Middle Caicos, South Caicos, East Caicos and the Ambergris Cays is world-class. 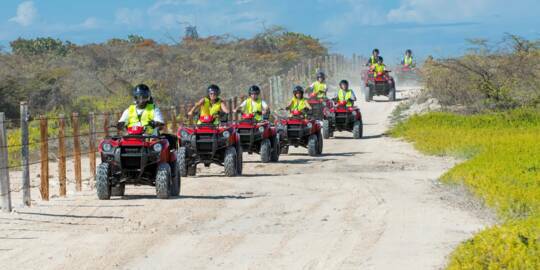 Although the options may appear limited when compared to our ocean attractions, the Turks and Caicos offers quite a lot to do on land. The Provo Golf Club on Providenciales is recognized as one of the top ten golf courses in the Caribbean. Several organized sports are regularly played here, including football, rugby and cricket, and tennis is offered at most hotels and resorts. Horseback riding along the beach and in the sea at Long Bay on Providenciales is another popular attraction that's gaining attention. 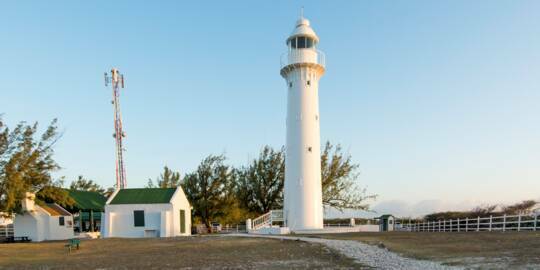 On Salt Cay and Grand Turk, the old-world charm of the classic Turks and Caicos can be experienced though the 200 year old colonial British Bermudian architecture of Cockburn Town, the free-roaming donkeys, and ruins from the sea salt industry days. 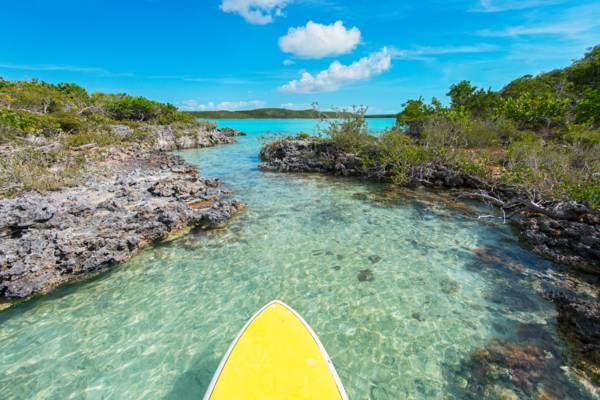 Stand up paddle boarding at Chalk Sound, Providenciales. The Turks and Caicos National Museum on Front Street in Grand Turk is another attraction that can't be missed. Amongst the exhibits housed in the museum are thousand year-old Lucayan artifacts and the Molasses Reef Wreck collection, where remains from the oldest European shipwreck excavated in the Western Hemisphere can be seen. There are many great scenic areas and spots of natural interest around the islands. Middle Caicos probably offers the most to nature lovers with the Mudjin Harbour coastline of two miles of breathtaking cliffs and beaches, and Conch Bar Caves, the largest above-ground cave system in the Bahamas - Turks and Caicos archipelago. An excursion to see the friendly Turks and Caicos Rock Iguanas on Little Water Cay is another great way to spend some time. Bird watchers will enjoy the natural parks and nature reserves found across the country, where flamingos, egrets, herons, ospreys, pelicans and ducks can be regularly seen. Near Salt Cay and Grand Turk, thousands of humpback whales pass through the Turks Island Passage in late winter every year. Which Island is the Best Choice for Your Vacation? Kayaking in the East Bay Islands National Park. Each of the islands in the Turks and Caicos offers something special. 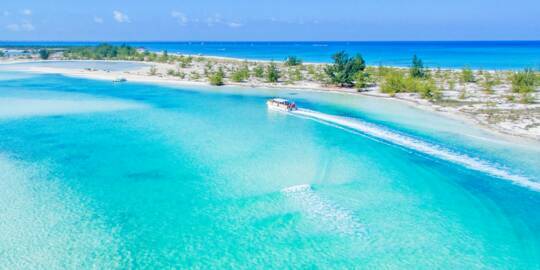 Providenciales features spectacular beaches, restaurants and water sports. Grand Turk has historical sites and a picturesque beachfront town. North Caicos and Middle Caicos are the garden islands and hide some of the finest coasts and landscapes in the country. 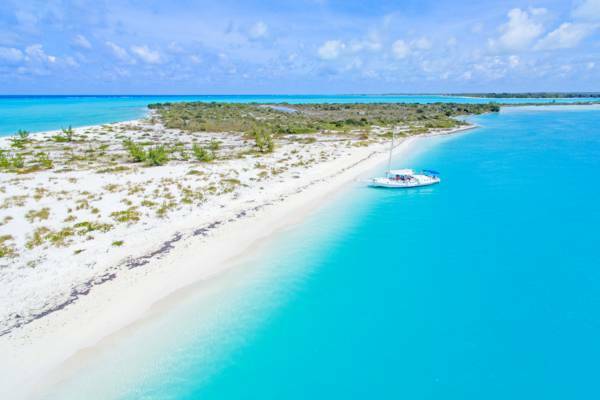 Last but not least are South Caicos and Salt Cay, which offer a perfect blend of Old Caribbean atmosphere and an unspoiled marine environment. It’s important to keep in mind that each of our islands supports varying levels of development, and not all water sports and activities are offered on each island. North Caicos and Middle Caicos are the only islands joined by a drivable causeway. It’s possible to travel between the islands for a day trip by passenger ferry or flight, yet you’ll have to arrange an additional rental car. If you’d rather have a guide, scheduled tours are also offered. If you have a specific activity or accommodation type in mind for your trip, there’s probably a clear island choice to go with. Browse the attraction, beaches and activity pages, and the island-specific things to do pages below for detailed information. 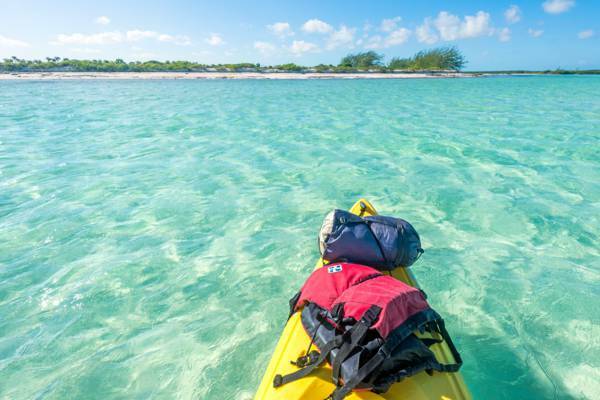 The island of Providenciales hosts by far the greatest number of water sports. In addition to the popular activities of snorkelling, scuba diving, and boat tours, there is jet skiing, parasailing, wakeboarding, kiteboarding, windsurfing, boat rentals, flyboarding, freediving, tubing, and more. Sailboat charter to the Caicos cays. Our undisputed top activity is simply enjoying and relaxing at our world-renowned beaches. 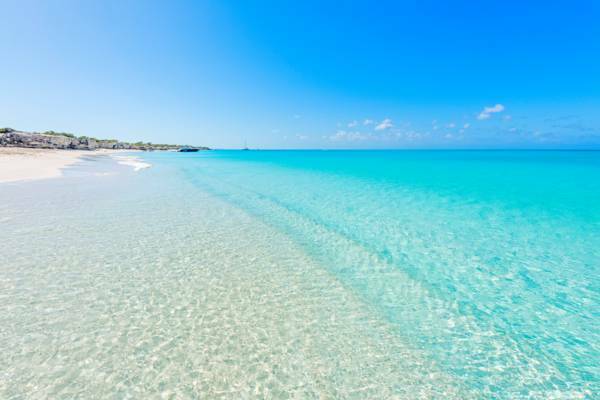 There are so many to choose from across the Turks and Caicos, all of which feature crystal-clear water and soft white sand. A boat tour will take you to the uninhabited cays, beaches and reefs that define our exquisite marine environment. 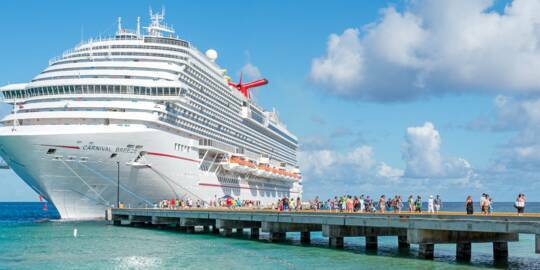 There’s a plethora of vessels, activities, and amenities available. Explore secluded beaches, see iguanas or stingrays, have a beach BBQ, or snorkel at an amazing reef. 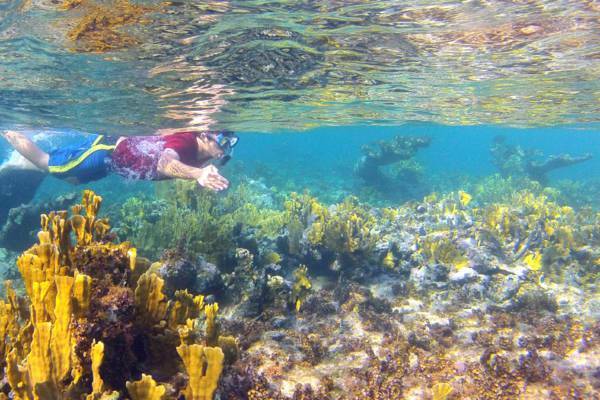 Snorkelling, both from the shore and by boat excursion, is a water sport we recommend to everyone. 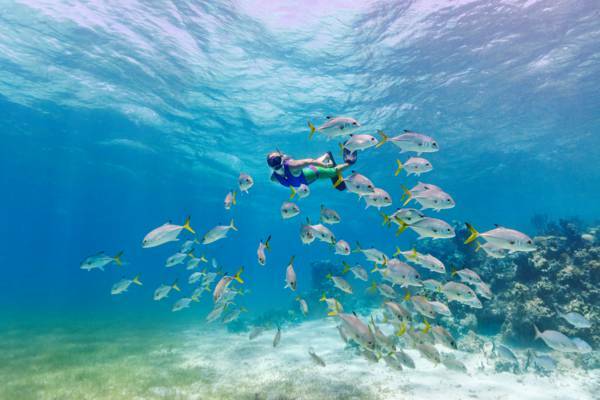 The reefs in the Turks and Caicos are teeming with ocean life, and there’s no better way to see a spectrum of fish and interesting creatures than in their own environment. Day trips to our less-populated outer islands offer the chance to discover an atmosphere of the Caribbean that very few have the chance to experience. North and Middle Caicos is great for the outdoor enthusiast, Salt Cay and South Caicos offer an Old World setting, and Grand Turk has some fascinating historical sights and the beautiful beachfront Cockburn Town. 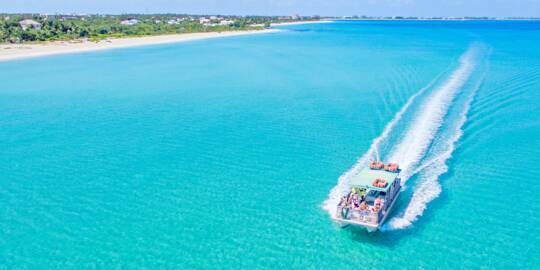 It’s easy to get around the Turks and Caicos by domestic flights and passenger ferries. Snorkelling at Smith's Reef on Providenciales. The Turks and Caicos supports extensive marine wetlands, and these mangrove channels and flats shelter incredible marine life, including juvenile sharks, stingrays, turtles, starfish, conch, and a wide range of bird life. The best way to discover our wetlands is by kayak and stand up paddle board. These eco-friendly water sports allow for silent access into the shallow environments that are home to the wildlife. 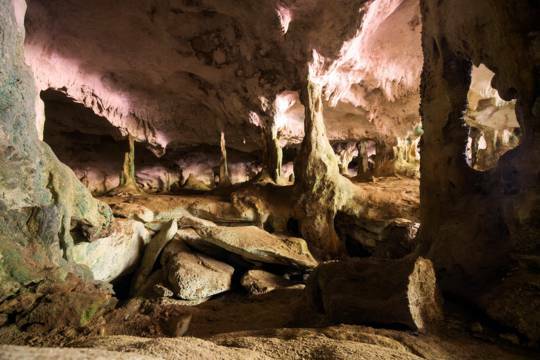 Did you know that the island of Middle Caicos is home to two globally significant Karst process cave features? Conch Bar Caves is the largest dry cave in the Bahamas – Turks and Caicos archipelagos, and hides miles of passages and several large galleries. It’s not quite a regular attraction yet, but the colossal Middle Caicos Ocean Hole is likely the widest blue hole on the planet. The uninhabited paradise of Little Water Cay and the adjacent Half Moon Bay is the perfect complement to a tropical vacation. There’s an incredible beach, the friendly Turks and Caicos Rock Iguanas, and a shallow lagoon with sandbars. The incredible beach at Water Cay. The majestic Mudjin Harbour on Middle Caicos is home to one of the most impressive landscapes in the Turks and Caicos. 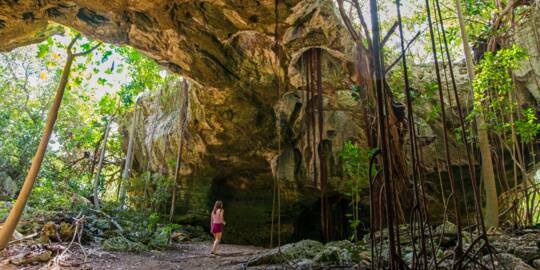 There’s a spectacular beach, high limestone coastal cliffs, and caves. It’s also the best place in the Turks and Caicos to watch waves break on the barrier reef. 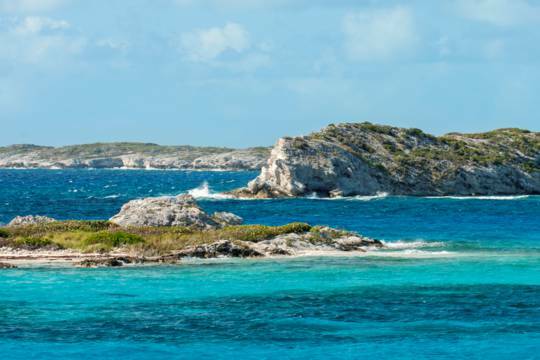 Chalk Sound National Park on Providenciales offers a landscapes that’s globally unique. Here, hundreds of limestone islands stand in a lagoon of brilliant turquoise water. The Turks and Caicos is home to some of the best wall diving in the world. Our islands are supported by an extensive underwater plateau, and the edges of this plateau are often sheer cliff faces. In addition to the amazing underwater topography, there’s plenty of fascinating marine life to see, from colourful reef fish and vibrant corals, to sharks, turtles, rays and more. Snorkelling with a school of horse-eye jacks at Smith's Reef, Providenciales. There are several things to be aware of when reserving boat charters, tours and activities in the Turks and Caicos. The availability and cost of activates varies both by season and island. The winter to spring “ high season” months experience peak visitor arrivals, and many local businesses become fully booked. If you’re vacationing at this time, we advise reserving well in advance of your stay. Likewise, the less-inhabited islands have fewer tour operators, so it also makes sense to book early. Be aware of cancelation policies before booking. Some businesses may charge the full fare if a cancelation is made within 24 hours of the activity, and 50% if cancelled within 2-7 days. This is especially the case with custom charters and sports such as horseback riding, wherein the operator has no feasible expectation of rebooking the vacancy with short notice. Generally, local companies are quite accommodating when it comes to bad weather, and do not charge if the event can’t proceed. This however isn’t always the case, so enquire. Many activity, accommodation and restaurant fee incur a government 12% tourism tax. This is typically added on top of quoted rates.